Happy Pancake Day! We can eat pancakes all day long so it's the perfect day for our little family :) This delicious soufflé pancake puffs up beautifully in the oven and is perfect enjoyed with an easy blueberry compote and your favourite pancake toppings! One of my favourite puddings ever is Fruit Crumble. It doesn't really matter that much what you pair the Crumble with (although my absolute favourite is apple and raspberry), it just needs as much flakey crumble as possible on the top (generally two to three times the amount regular recipes would suggest!) I always think of it being an autumnal-going-into-winter pud but I have a recipe for you that transforms it into a light, beautifully fresh cake that brings with it the sweetness and summery fruits that are just coming into season. These Strawberry and Rhubarb Crumble Muffins are simply divine. Strawberries are so sweet at the moment and they add freshness and juice to the final cakes. The cakes themselves have a delicate crumb and with the moistness of the strawberries they are quite fragile. I tried making them straight in a muffin tin, but having a wrap around the outside really helps hold them together, although you could use cupcake papers instead. The idea for this came from my Apple and Rhubarb Crumble Cake which I was going to make the other day and then I decided I'd love to put some fruity strawberries into it instead. They are are stirred through the batter and then topped with rhubarb and finally the crumble. The hardest part of making these muffins is the chopping! I suggest cutting up the fruit into very small pieces, particularly the rhubarb. And I always start making these by doing this job first. My recommendation is around four large strawberries for six muffins and one stick of rhubarb. Then I make them crumble -- you can either rub the butter into the flour and sugar with your fingers or blitz them in the food processor. The muffin batter itself is very simple. We cream the butter and brown sugar, then add the eggs and vanilla. Once they're all incorporated, sift the flour over the top, mix thoroughly and then finally stir through the milk and strawberries. I use an ice cream scoop to fill my muffin cases and once the mixture is divided evenly amongst the cases, sprinkle the tops with rhubarb and then finally the crumble (and I like to completely cover the top of the muffin with the crumble layer, so you can't see any fruit peeking out). They should be baked for around 25 minutes and you can check them as you would with any other cake, by checking a skewer inserted in the middle comes out clean. Once they're baked and out of oven, we leave them in the tin for around 10 minutes and then lift them out carefully to cool on a rack. I recommend leaving them in their wrappers for stability -- they do firm up as they get cooler but they are at their most delicious warm from the oven. These muffins are perfect for coffee mornings, lunch or afternoon tea. They do have a sweet sugary hit from the crumble which might seem a bit over-indulgent for breakfast, but just amazing for brunch! Enjoy them warm from the oven for the best taste experience! The weekend was so lovely. Mostly sunny, a little rainy and packed full of family fun. And an extra (bank holiday) day is always an added bonus :) And then today one of my boys felt too poorly for school so we decided to make something yummy to cheer him up! The first time I made Monkey Bread it was a complete success in our house. All of the boys asked when I was going to make it again so I knew it was definitely a winner! Today we made a slightly different version and played around with one from the Australian Women's Weekly. It made me giggle that's it's in the category for "The Lazy Baker"! I'm not sure I agree it's for the lazy baker but it's a version of monkey bread that doesn't contain any yeast and you don't have a wait for a rise so I guess that could be considered a kind of lazy :) What I love about this is that the balls are filled with spiced apple making them soft and yummy on the inside whilst they have a crunchy sugary outside. Then once it's baked you top it with a delicious caramel sauce. Doesn't that all sound like absolute heaven? I used a bundt tin to bake my bread. To ensure that it's baked all the way through, we need a pan with a tubular centre so a kugelhopf or bundt tin is ideal for this. The tin needs to be greased and then floured VERY well. As with all bundt tin bakes, I find the success is all about the greasing of the tin otherwise it's almost impossible to get it out of the tin in one piece. Once the tin is prepared, we make the apple. After peeling, coring and cutting up the apple into small pieces, it's brought to a simmer with water, cinnamon and allspice and then heated for ten minutes to become soft. Then set aside to cool down. The dough is simple to prepare. We mix the flour and sugar and then rub in cold butter with your fingertips to get the consistency of breadcrumbs. Then add the buttermilk and cut it through the mixture until a dough is formed. We gently knead it for five minutes until it's a soft dough. Then weigh the dough and divide it into 14 equal pieces. Roll each piece into a ball and then flatten it until it's an 8-10cm circle. Then we place a teaspoon of cooled (if it's too hot it melts the dough) apple sauce into the centre and pull the sides up around it, pinching them closed at the top. Each ball needs to be rolled in melted butter, then a mixture of brown sugar and cinnamon and finally arranged in the tin in 2 rows - depending on your tin, around 6 balls at the base and then 7 on top. No proving is required for this bread, so we pop it straight into the oven for 20 mins and then after covering it with foil, bake it for a further 15 minutes. When it's finished baking, it needs to be left in its tin for 30 minutes and then gently removed. You will need to loosen it from the sides with a palette knife and then gently turn it out onto a plate. For the caramel sauce, I used the same recipe as for my Anzac Biscuits with Salted Caramel. We melt the golden syrup and sugar in a saucepan and then stir in the butter, cream and salt. This is then drizzled over the top of the bread. This is a lovely bake that is especially yummy straight from the oven. The little balls taste like delicious doughnuts (with a gorgeous cinnamon sugar exterior) and are light inside with an extra special surprise of spiced apple. They are perfect for breakfast and brunch but would also be a great pudding for supper with friends. First of all, grease your Bundt tin with butter and then a coating of flour over the top of the butter - it's very important to grease all the nooks and crannies of the bundt tin otherwise there's a good chance your final bread will stick to the tin and not come out in one piece! So there's this pan. We've had it for, oh, maybe ten years. It's been sat in a drawer at my parents' house, unloved, and I rediscovered it over easter. It makes Æbleskiver, Danish Pancake Puffs, which I have discovered today are, quite frankly, delicious! They are little light balls which can be filled with all sorts of flavours. The possibilities for flavour combinations are endless but the ones I'm making are filled with mascarpone and lemon cream which is tangy, fresh and decidedly yummy. If there's one person that's possibly even more addicted to baking and cooking ware and gadgets than me, it's my mum! When they spent a decade out in Toronto, we discovered our love for Williams-Sonoma and my mum used to get drawn into all the in-store demos and come home laden with all the necessary kitchenware and ingredients required to make them at home. Cue, the Æbleskiver pan. I secretly love the hordes of different cooking bits and bobs she's gathered over the years! Making these pancakes was a voyage into the unknown as I haven't made or tasted them before. The batter and filling are simple to make; the cooking of them takes a little more technique! 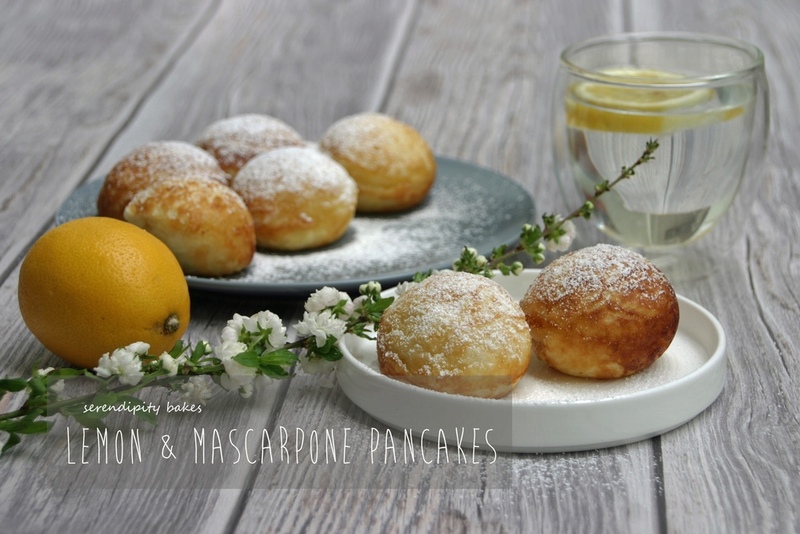 We start by making the Lemon and Mascarpone Cream which is as simple as it sounds -- equal amounts of mascarpone and lemon curd beaten together for a few minutes until smooth and creamy, then refrigerated until you're ready to cook the pancakes. I would make this to taste and would have an even tangier lemon cream next time as it's one of my favourite flavours. The pancake batter is again an easy recipe using buttermilk. First of all, the dry ingredients are mixed together in a bowl. Then the egg yolks are lightly beaten in a separate bowl and the buttermilk whisked into the egg mixture. This is added to the dry ingredients and mixed until combined. You get a rather lumpy mixture so don't fear if you don't have something beautifully smooth at this stage! As I whisked the egg white to stiff peaks, my batter puffed up in its bowl and then I added the egg whites in 2 stages, stirring through with a metal spoon. We're almost ready to make the pancakes but first need to melt some butter for your pan. The process moves pretty quickly now, especially if you have different measuring spoons trying to get everything into the pan in order. First of all, you pop 1/2 tsp melted butter into each pan cavity and wait for it to bubble. Then add 1 tbsp batter, top it with 1/2 tsp lemon cream and then finally cover it with another 1 tbsp batter. This is all quite fiddly and I had the heat up too high for the first batch so trying to get all of these different elements into the pan before I needed to flip each ball was all very hectic. I abandoned the spoons for the second batch and popped the batter and lemon cream into two separate piping bags. Much simpler! I also turned the heat down to low so the whole process felt much calmer :) After you've added your two lots of batter and cream to each cavity, after 3-4 minutes the balls should be ready to flip. When we make regular pancakes, we always wait for the first few bubbles to appear on the surface so we know we're ready to flip them and these little balls were the same. They're also pretty easy to slide around and check how well cooked they are underneath. I spun them round with the aid of two teaspoons but you can use cocktail sticks if you prefer. They come out of the pan very easily and after you transfer them to a plate, liberally sprinkle them with icing sugar to make them look really pretty. I squirrelled away a few of them for hubby tonight and just thought I'd check out whether they're still good cold and I am very pleased to confirm that they absolutely are -- think doughnut texture and super yummy! Who's excited about Pancake Day? Our boys are so excited and I just know we'll be making them pancakes for breakfast, they'll get them at school and will demand them for dinner too! We are huge pancake fans in this house -- the boys would eat them every day if they could but we restrict them to once or twice a week. This is a different kind of pancake -- possibly my new favourite kind -- that I've been trying out in advance of the big day in a couple of weeks. Ever had a Dutch Baby? Making pancakes generally means hubby standing at the stove flipping a neverending supply of them onto our plates and our boys can eat a LOT of pancakes. After about 20 minutes, they declare they're full and he finally gets to eat his share. So if breakfast time is similar in your house and you haven't tried a Dutch Baby, this scenario will melt into the background. Cue one giant pancake, extremely filling, that you bake in the oven and then you all get to eat it together with your favourite toppings. Especially a cute little recipe for Maple Pecan Butter that is simply to die for. Looking good? So I think I've said once or twice on here that Pumpkin is one of my favourite ingredients. I know it's more autumnal than winter, but when the weather is bleak outside, you need something to cheer you up and pumpkin makes a very filling and hearty ingredient (plus it's a vegetable so that must get a big tick!) I first fell in love with pumpkin when we used to visit my parents in Toronto and bought tins of Pumpkin Waffle mix from Williams-Sonoma. They are the best. But you can only get it around Halloween in their stores and we don't have the opportunity to travel to Canada right now. So I decided to bring the Pumpkin to a Dutch Baby and I promise you, this is amazing - the Pumpkin Dutch Baby with Maple Pecan Butter. So if you're going the full mile and making the Maple Pecan Butter too (and I seriously suggest you put in the effort as it transforms the dish) you'll start the day before you plan to eat. I had some maple butter years ago in a London breakfast cafe with waffles and it was amazing. The consistency is very smooth and soft -- I refrigerated mine as I wanted the butter a little harder and this worked but it does soften up relatively fast once out of the fridge. I thought it would be as simple as softening some butter and adding the maple syrup and pecans and it is a bit more complicated than that -- but not too much! You do need a candy thermometer as you first need to gently heat the maple syrup and cinnamon stick to soft ball stage (240 degrees), then remove it from the heat, remove the cinnamon stick and add the butter. Then transfer it to a stand mixer and beat with the paddle attachment for 8 to 10 minutes. It will transform pretty quickly -- I wasn't happy with the consistency after 8 minutes (not firm enough) and less than 2 minutes later it had completely transformed so do keep an eye on it. Mix through the pecans and pop it on to some clingfilm and roll it into a sausage shape. Then refrigerate until you need it but mine had around 24 hours in the fridge. The ratios of the ingredients are 2:1 maple syrup:butter if you want to upscale it and make more. It keeps for around 2 weeks in an airtight container in the fridge. The Pumpkin Dutch Baby itself it very straightforward. Think making pancakes and it's a one bowl and one skillet recipe. All of the ingredients go in the one bowl to be beaten. The one things to remember is that the eggs and milk need to be at room temperature. The skillet is heated in the oven so it's very hot, then the butter added and finally the batter. Then popped back in the oven for around 15-20 minutes. The outsides should be puffed and golden; the insides more of a custardy consistency. When you plan to serve this, it's best to have everyone sat ready at the table as it can deflate quickly -- so it's out of the oven, toppings on and onto the table in a couple of minutes to have the full effect. This is delicious. The inside is like a pudding | custard and I love the orange tinge that the pumpkin brings to it. As the Dutch Baby itself doesn't have sugar or sweeteners in it, it does need lovely, sweet toppings. Mine had the Maple Pecan Butter, extra pecans, icing sugar and maple syrup to crown it -- you don't need all of these (I think it would be delicious with caramelised banana or lemon and sugar or just maple syrup or honey) but it's one of those dishes you really want to dress to impress. And the great thing about a Dutch Baby is that if you think of it just like a pancake, you can make up your own variations with fruit inside the batter (apples, strawberries, bananas, blueberries) and really get creative. If you fancy another alternative creation for the big day, you could also check out this fabulous Dulce De Leche & Mascarpone Crêpe Cake -- Dutch Baby for breakfast and Crêpe Cake for tea, anyone?! There are times when I wish our senses could transcend the written word. Like right now. If you could smell the warm, sweet, maple syrupy smell coming from my kitchen at this moment, you'd be in love. Just like me. And it doesn't just smell good - the taste is even better! The recipe comes from James Martin's Sweet which I highly recommend if you're looking for lots of sweet delights to bake. I love James Martin and his recipes (whether from this book or his other savoury ones) always turn out brilliantly. They're easy to follow and always work. Win win. And there are lots of beautiful photos to inspire you! This is simple to make but, as with all bread, you do need a little patience for the proving. The dough itself is straightforward - the milk is warmed in a saucepan, the yeast is added and then it's mixed with breadcrumbs made from flour, sugar, salt and butter. I mixed the breadcrumbs by hand but then I used my standalone mixer and dough hook to combine all the ingredients. You can work the dough by hand if you don't have this equipment - it will just take you 15 minutes rather than the 5 minutes with the dough hook. But you get bonus points for giving your arm muscles a workout! When the dough is tacky to the touch, it's put into a bowl, covered and left for around 2 hours in a warm place until doubled in size. When it's ready, butter a 23cm savarin mold. I didn't have one of these so I used an 8 inch cake tin. You're going to make 30-35 dough balls with your dough so weigh the dough and then work out how much each dough ball should weigh. I kept my scales to hand and weighed out each amount of dough and then formed it into little balls. Then each ball is dipped into melted butter and rolled in a mixture of demerara sugar and cinnamon. By the time I formed my last ball the sugar was a complete gunky mess, clumped together with the butter, but keep going. Then place the balls into your cake tin. My bottom row was 2 balls wide (leaving a hole in the middle as it would have with a savarin mold) and then 1 circle of balls on the top layer. The dough is left to prove again, lightly covered with some oiled clingfilm, for around 45 minutes. I generally leave my dough to prove for the second time overnight which I did with this bake but you need to ensure that you don't leave it in too warm a place as the butter will melt. I found that happened a little with mine (it didn't affect the final outcome as far as I can tell) but I suggest you place it on a baking tray when proving otherwise you might get a sticky trail when you come to pick it up! When you're ready to bake it, preheat the oven to 180 degrees. Bake it on the baking tray for around 25 minutes until it's golden brown. I did find that the the middle hole disappeared as it baked and because I wasn't using a savarin mold, the middle dough balls underneath aren't cooked quite as well as the outer ones, so a savarin mold is preferable if you have one to hand, but not absolutely necessary. When it's out of the oven, it's coated with 100 ml of maple syrup, left for 2 minutes and then turned out on a plate. Mine was pretty sticky and did try to come apart when being lifted from the tin to plate but I managed to get it there in one piece. It's crucial that you remove it from its tin this quickly. Then it's bathed in another 100ml maple syrup. It is a thing of beauty. Simply delicious and especially good straight from the oven. I'm looking forward to trying other variations of Monkey Bread but wanted to try this one first. We are firm maple syrup lovers in this house so I know it will be a big hit when the boys come home. So I loved the last, my first, brioche that I made. But I've read about other ways of proving this lovely sweet dough and wanted to try a different recipe. I saw a Pin for this lovely Raspberry Swirl Brioche from Hint Of Vanilla which drew me in and although it has more stages than my last brioche, I knew I wanted to try this one next. This recipe uses very exact quantities of ingredients, in particular the eggs which need to be weighed. The first addition was around 2 eggs. The mixing of initial ingredients is all very straightforward, but then it came to full gluten development (* this is when you stretch a little dough between 2 fingers and it should be so elastic that you can see through it without it breaking) I wasn't sure how long this would take and it actually took around 15 - 20 minutes in a mixer with the dough hook to get there. This heats up the mixture so after the final egg addition, I measured the temperature and it was 25 degrees (needs to be less than 27 degrees). The fermenting was again pretty straightforward and then I transferred the dough to the fridge. The recipe suggest between 1 and 12 hours - I left mine for around 1.5 hours. When it came out of the fridge it's rolled into a rectangle and covered with a gorgeous Raspberry Smear. Now this smear is absolutely delicious. A raspberry flavoured butter that is rich and creamy. Megan made her smear with powdered raspberry and since I didn't have any of this I used a tube of freeze-dried raspberries that I blitzed in the food processor (then sieving the powder to remove the remaining raspberry seeds) and mixed this with butter, sugar and lemon juice. I also didn't have vanilla sugar so I just used regular caster sugar. This brioche was absolutely delicious. So delicious that I'm thinking of making another one this week. Hmmm...what flavour combinations to try next? Or maybe just a plain simple brioche that everyone can dress as they like. The possibilities are endless. Transfer the dough to a baking tray lined with silpat or greaseproof paper, wrap it with plastic wrap and refrigerate for 1 - 12 hours. Try not to eat it all at once!! I really wanted to make brioche. It's one of my favourite breads. But I'm always a little nervous of bread. Making it, that is. I've faced my inner demons and made this and this but I still take a deep breath every time I embark on a new bread project. Still, I decided I wanted to make brioche and found this delicious Chocolate & Hazelnut Pull-Apart Brioche from Butter and Brioche. Thalia photographs her bakes perfectly and has really detailed instructions on how to make everything so I just love following her blog. The dough recipe is pretty straightforward. Making the initial dough is a 2 step process and then the butter is added giving it the richness you'd expect from brioche. I used my standalone mixer and dough hook to get me to the stage when I was ready to roll out. The brioche dough looked as I expected it to but I found it really sticky when I was to roll it out. Thalia suggests that the work surface should be lightly floured but I found that I needed much more flour (probably too much) to be able to keep the dough moving. When the dough is shaped into a rectangle, it is then spread with Nutella (yum) and sprinkled with hazelnuts. The original recipe adds extra chocolate chips here which I didn't use, but I think it would work with and without. The cutting of the dough requires some precision but is at the same time fairly forgiving. You cut the rectangle into long strips and place them on top of each other. Then cut this thin tower into equal squares and stack them in the tin. I had a little bit left over which I squeezed down the side and as it's tear and share bread, it just merges into the one loaf (why I say it's pretty forgiving). Then we leave this to prove and then bake it in the oven. Now the original recipe says that it will increase in volume during proving until it's above the top of the tin. Mine didn't rise that much but I decided that I would still put it in the oven after the 1½ hours so mine looks a little flatter than Thalia's lovely loaf. There are other brioche recipes I'd like to try but this was a great recipe to start with. I love naked brioche with jam for breakfast but the Nutella adds an extra richness. I'm not a huge fan of the chocolate spread but I think it works really well here. I might, in fact, reduce the amount of hazelnuts and add in the chocolate chips next time as well as the Nutella. I love tear and share bread. It's really convivial to have sharing platters of food and long lunches or dinners with good friends. I haven't had a sharing sweet bread before and this is a wonderfully yummy one for my initiation. Hello! We're back and after a few days of jet lag and the worst cold and crazy party planning for my littlest's 5th birthday party at the weekend, today I made the yummiest chocolate brownie creation - in my waffle iron! It made me giggle last week when I read an article somewhere about epic pinterest fails - and one of them being the chocolate cakes (or was it cookies?) in the waffle iron. But why should that stop me having a go?